Honestly, it needed doing more than any of the other four rooms that I've redecorated over the last year in our home. It was feeling more and more like there was a grown up secondary school student living in a little girls room, which was exactly the case. I think I'd hesitated completely re-doing her room because she's at an age where she's growing up so fast and I didn't want to have to do her room again in another year - I wanted something that would last a good few years without her outgrowing it, and importantly without it being bland and boring. The thing with kids rooms, is that their needs do change - much more than your average grown-up, and their rooms need to change with them. But this time, I wanted to make sure that her room could transition with her as she goes from tween (she turned eleven in July), to teen, which I know will happen in a nanosecond. She'd previously chosen quite a bright lavender wall colour which was full of patched holes from where pictures and shelves had moved about as her needs changed over the last few years, that I'd filled but never got around to painting. I'm ashamed to say it was actually looking kind of depressing. Wall colour was an important choice of course - she originally wanted pale grey, so nice and neutral (I think the bright lavender was driving her nuts! ), but then decided it might be a bit depressing (her words, not mine), and wanted pale blue instead. Boy have we been through some tester pots to find 'the one'! I have to say that I find pale blues particularly tricky. They look great on paint charts, only to look completely wrong in-situ. For a while I had thought about painting the living and dining rooms pale blue, but I actually gave up finding the right one in the end. Too grey, too bright, too dirty, not dirty enough, too icy, not blue at all etc etc etc! I had originally dismissed Borrowed Light by Farrow and Ball as too grey for her room, as I had for the living and dining rooms, but last week I decided to paint a larger patch on her lavender and blue patchwork walls and I'm so glad I did. Turns out it isn't too grey at all, it was being overwhelmed by all the brighter blues I'd plastered around it, not the mention the original lavender colour. It's actually the prettiest, softest pale blue with just a touch of grey and green - in fact EXACTLY what I'd be searching for, and it had been sitting right under my nose, discarded and overlooked, in my ever-growing, over-flowing tester pot cupboard for months. Note to self: with more subtle colours, you need to paint a much larger test area (or buy a roll of lining paper, and paint some big pieces you can tape up, and you might also want to leave a white border around it so that the colour in question doesn't get overwhelmed by other stronger colours around it. I think this is what happened in the living and dining rooms too, though I'm completely in love with the colour we went with in there in the end. Anyway, my young client agreed it was 'the one', and this week I started the job of transforming her room. Of course, it took a LOT more time than planned - way more prep than anticipated, and clambering around and over furniture is less than ideal. Still, it was worth it and I finished painting yesterday. Actually, I still need to do the window frame and floors but they're not on the top of my painting priority list right now. Of course, it's not just the walls that need attention, I wanted to give her room a more pulled together and grown up look, that will last a good few years with perhaps just some accessories being changed as she gets older. We're getting rid of her high-sleeper bed, and bringing back her off-white metal vintage hospital style bed that Baxter has been using. He's either getting bunk beds, or a mid sleeper from Ikea which of course I will have to paint. Or I might get him another metal bed, but I haven't decided yet. Getting rid of the high-sleeper which has a built in wardrobe, means she'll be wardrobe-less, but she hardly owns any clothes that require hanging, so for now, we're going to solve this issue with a free-standing full length Ikea mirror with a hanging rack behind it. Special dresses that barely ever get worn will go in our wardrobe. I just don't feel it's an essential item for her right now, when 99.5% of her clothes live in her drawers. And my mother will be over the moon that the house without a full length mirror, finally has one when she next comes to stay! We bought the 'Flights of Fancy' House of Hackney fabric several months ago at their sample sale with her room in mind. Initially I thought I might try my hand at an upholstered headboard, but I've decided that I'm going to make a Roman blind out of it. I love that if you use a really amazing fabric for Roman blinds that they're like an art panel when down. I would never have bought such expensive fabric for a kids room normally, but she loves it and at £20 a metre at the sample sale, I thought why not? There will be some left over for a bolster cushion for her bed too. 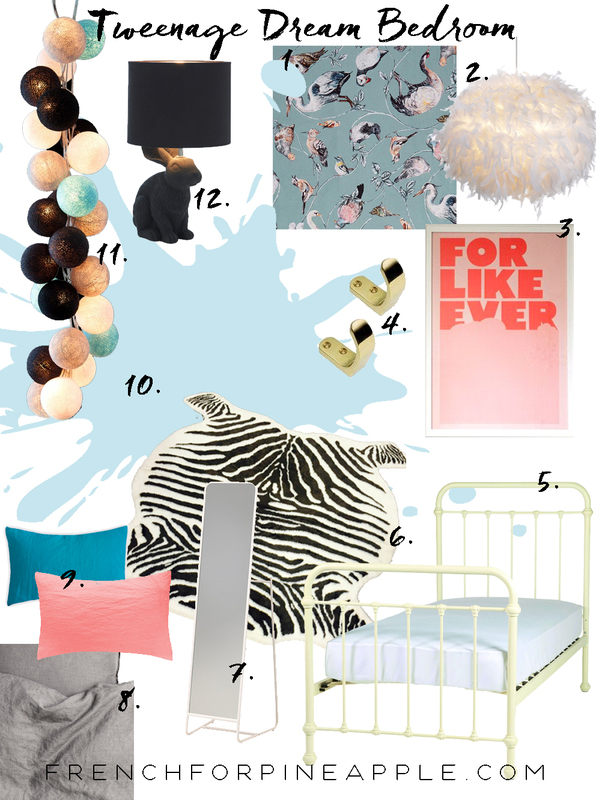 So here's a mood board of where were heading with the overall look of her room - slightly dreamy and ethereal, but not over the top girly. Once we sell her bed, it should be a quick transformation since the painting is done and we already own nearly everything else - I've ordered some Cable and Cotton lights which I've always loved the idea of in her room, and I'm getting a similar set to the ones on the moodboard, but with the addition of a pale pink. I love that you can build your own set which is so great for bringing the colours of a room together. And don't you just love that feather light shade?! £28 from B&Q. Yes, you read that right. I snapped up the last one at my closest B&Q last week, and it's already made her room feel cosy and inviting next to the perfect blue. I might want to move into her room myself! I know some of you are probably thinking, that's what you said about the living room, but there are a few little things that need to be finished first. But soon, I promise! !